In music we categorize the sound of instruments as soprano, alto, tenor and baritone according to the pitch and resonance of their natural voice Because of its attractive resonance and full tone at lower tunings, we feel that the Canopus L30-1465WN deserves the name “Baritone Snare Drum”. It is a fact that, at lower tunings, the sound of many snare drums is dominated by the sound of the drum-head rather than the shell and they seem incapable of producing optimum resonance and tone. To overcome these problems, we have designed a thinner walnut shell and coupled it with a perfectly shaped bearing edge. This combination allows the shell to resonate, and the head to vibrate naturally, at all times – even at lower tunings. 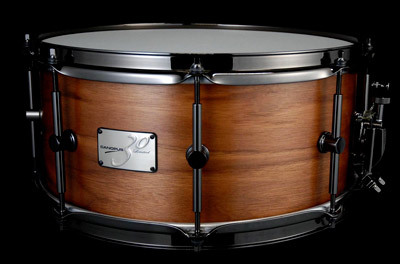 The L30-1465WN “Baritone Snare Drum” showcases all the unique characteristics of walnut – quick, crisp response and controlled overtones, with a focused, mellow and low-pitched tone.